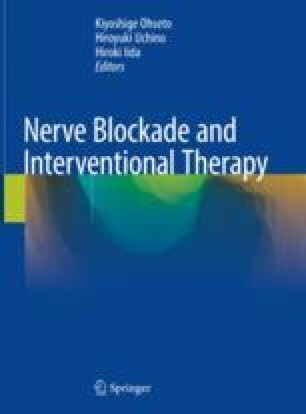 Among the procedures for thoracic epidural block, the landmark method has a longer history than the others and is well established. Thoracic epidural block is sometimes difficult to perform because the spinous processes are long in the mid-thoracic region compared to epidural block in other regions. In patients with spinal deformity or severe obesity in which it is difficult to perform the landmark method, the X-ray-guided method should be adopted. The X-ray-guided method can confirm the expanse of drug solution and intravascular infusion in real time. However, this technique involves exposure of the patient to X-rays. Ultrasound-guided thoracic epidural block requires an assistant to hold the probe. It can be adopted prior to the procedure, to measure the distance from the epidural space and skin surface, and determine the site of puncture in pediatric patients and obese individuals. Ultrasound-guided block is easy and can be performed at the bedside without concerns regarding X-ray exposure. We expect that future improvements in ultrasound instruments will result in epidural block under ultrasound guidance becoming easier to perform.